This meme was sent via campus mail from Dean Liliana Rodriguez. After months of planning and preparation by the Office of Student Engagement and the LSE Committee, this year’s “Worthstock Weekend,” which traditionally spans the first weekend in May, is slated to have multiple live music events, as well as other outdoor activities. This year’s incarnation of the event is also the first to be held under the guidelines of the new drug and alcohol policy, which is creating tensions between the student body and the administration. This year’s Worthstock Weekend will be the first held since the prohibitions on drinking games, hard alcohol, and drug and alcohol paraphernalia from public party spaces. In an email sent midday Wednesday by Associate Dean of Diversity, Inclusion and Community Development Liliana Rodriguez, the details of how the new drug and alcohol policy will affect the coming weekend’s schedule of events were laid out. All guests to Worthstock Weekend will be required to present a state ID and be accompanied by a Swarthmore student as their host. The email also restated that hard alcohol of any kind is prohibited, and that flasks would be confiscated if found. The most significant of the changes mentioned is the institution of a limit on how much alcohol can be brought into the space: individuals over the age of 21 are allowed to bring either a six-pack of 12oz. beer in aluminum cans or a 750ml bottle of wine for the entirety of the event, and those bringing alcohol into the event must check-in at a separate line from the rest of the student body. The email also prohibited bringing tables or furniture of any kind into Worth Courtyard, which has been permissible at, and arguably a staple of, the scene in past years. When the email was sent out to the student body, students immediately took to social media platforms such as Yik Yak and Facebook to express their dismay and disappointment at the changes to Worthstock Weekend. Several Facebook events, the most prominent being “Mertzstock,” have been organized for Sunday as alternatives to Worthstock. It appears that the intention of these events is to provide party spaces more similar to Worthstocks of the past, where drinking games and other paraphernalia were permitted. It remains unclear if these student-run party spaces will be subject to the same regulations under which Worthstock is currently expected to operate. 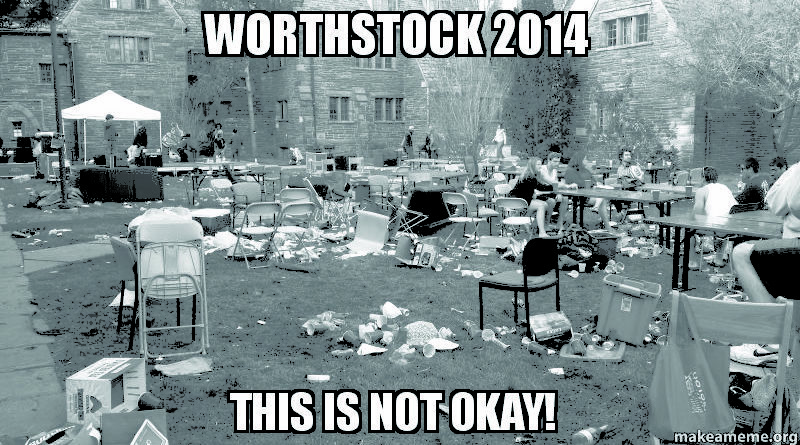 Noah Weinthal ’15 believes that the changes to the policies governing Worthstock are a way, in part, to combat the amount of trash and debris left over during last year’s event that caused significant delays to many college administrators and grounds staff’s schedules. In a Facebook post, he recalled watching intoxicated students walking through Worth courtyard after the day’s events had concluded, passing by college staff cleaning up broken glass and other waste that had been left behind earlier in the day by students. Despite the divisive nature of the new drug and alcohol policy and its effects on the weekend, there are a wide variety of events and activities scheduled to take place. This year’s program of events will kick off on Friday evening with an array of local food trucks at Parrish Circle, followed by a campus-wide laser tag battle on Mertz Field. Friday night will conclude with a live performance by New York-based trap artist TWRK, known for their collaboration with artists like Diplo and others on the Mad Decent record label. On Sunday, another round of food trucks will be at both Benjamin West Parking and Parrish Circle, and other activities including a rock wall, zip line, and water slide will take place on Mertz field. The weekend’s events will culminate on Sunday with seven hours of music in Worth Courtyard by BADBADNOTGOOD, Ghostface Killah, The People’s Republic of Funk (the winner of the OSE’s Battle of the Bands competition), and other artists. One of the biggest tasks assigned to the LSE committee is selecting the artists that will perform throughout the schedule of the weekend’s events. Atousa Nourmahnad ’17, a committee member, noted that the staging and audio capabilities available at the college ruled out the possibility of bringing larger groups to campus, and limited the selections to electronic artists, DJs, or other single-person acts. Samira Saunders ’18 expressed appreciation for the collaborative and generally stress-free nature of the committee and the process of choosing artists to perform during Worthstock Weekend . “[It was] really a collaborative process and it went really smoothly,” she said. 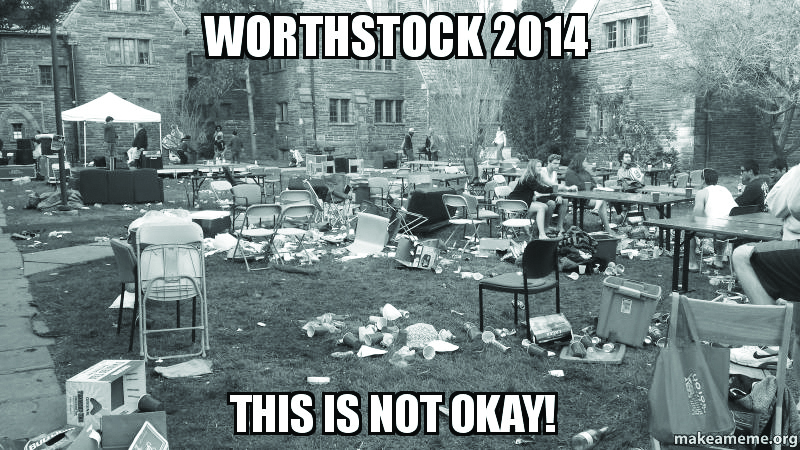 The goal of Worthstock Weekend remains the same as its previous incarnations. It is meant to be a weekend where students can relax and unwind before final exams begin. But members of the planning process and the student body at large anticipate this year to be slightly different. Nourmahnad noted that because the committee was much more organized than committees of previous years, they were able to be more creative with the sorts of events and activities they wanted to bring to campus this year. Instead of just inviting performing artists to campus, the increased creativity of the committee led them to hold more activity-based events, like the water slide and rock climbing wall. Noah Rosenberg ’17 felt that last year’s Worthstock Weekend fell victim to logistical problems, such as the choice to hold the White Panda’s show in Science Center Courtyard. This choice of venue made the crowd appear smaller than it actually was because the space was so large, and dampened the overall atmosphere of the event. Despite this, Rosenberg has high hopes for this year’s events. “This year, I think it’ll be much better because Upper Tarble is a better location [for the large scale events]. I’m still not sold on Swat students loving trap music or EDM, at least not enough of the campus to make it a large event, but I think it’ll be much better,” he said in an email.